My answer is always the same. Sales and marketing skills are increasingly important if you want to get your stories published in this highly competitive print media field. 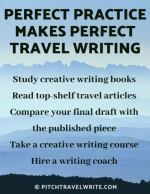 Assuming that your writing is publishable, your success or failure as a freelance travel writer will be determined almost entirely by your sales and marketing abilities. This is a bold statement. 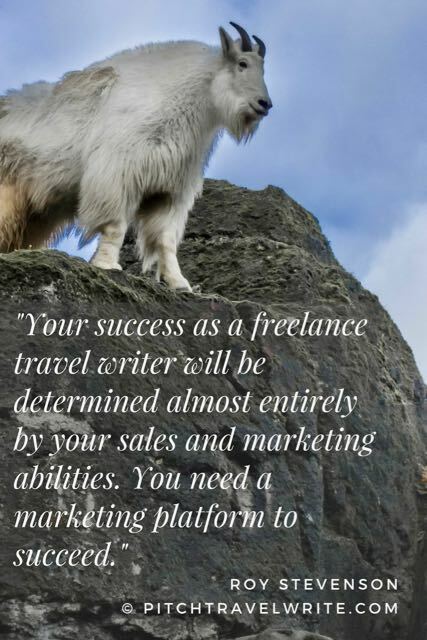 For the professional 21st century travel writer this means you need a marketing platform. It’s no longer a ‘nice-to-have’ option. In fact, it’s critical to succeed. Up until 2010 you could slide by with just a decent story idea and a well-crafted query letter. But since then, hordes of travel writers and bloggers entered the arena. If you want to stand out from the thousands of other travel writers and bloggers, you need a marketing platform. In today’s terms, that means a convincing online presence. Without it, you’re not likely to progress any further than writing for other people’s travel websites. What Is A Writer’s Marketing Platform? First let’s establish what a marketing platform really is. This vogue term is bandied about at writing conferences, but few people clearly define it. In its most literal sense, a platform is a stage used by a public speaker to be better seen by the audience. In America we often refer to a platform as a “soapbox”, a wooden crate used as a makeshift stand by traveling speakers. Standing on the soapbox, they can publicly tell their message, sell their products and promote themselves. Physical platforms have been around for centuries. With the printing press we were able to disseminate information about ourselves by printed media, such as mass mailers or brochures. Platforms have changed over time. The latest platform is, of course, the Internet. Today we no longer need to carry around a wooden box or distribute mass mailers through the post or by hand. We simply communicate with our audiences online, via the Internet. The online stage is the contemporary marketing platform. Definition: A marketing platform is the sum total of all the travel writer’s self-promotional activities, usually online, that we use to sell our stories to magazine editors. You’re probably wondering, is this something I need as a freelance travel writer? And how can it help me? 1. An online marketing platform gets your message to potential editors. Today, as one single person, you can create and use your online voice to get your message out to your prospective customers, in this case, magazine editors. 2. It enhances your credibility. Having a large and strong online marketing platform provides easily accessible evidence to people searching for information about you. Your credibility is enhanced with magazine editors and destination marketing organization (DMO) media reps. When editors are impressed by what’s on your platform, they see you as a credible freelance writer. They trust you . . . and their doors open to give you writing assignments. A side benefit of having a solid marketing platform is that it helps you get DMO assistance with your travel plans when you’re on assignment. 4. It helps editors make a decision about hiring you. Here’s an example of how a marketing platform could help you land assignments. Let’s take a hypothetical situation where a magazine editor has just received excellent, well-written query letters from two different travel writers. The editor only has space in an upcoming issue for one article. Both story ideas have appeal to his readers. The editor has to make a subjective decision about which story to commission for his magazine. The editor decides to research both writers online. 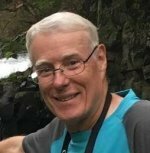 He’s looking for clues about who looks easier to work with, whose writing style seems like the better fit, and who has been published more prolifically. If one writer has little or no presence or evidence of his or her work online, the editor is unlikely be impressed. There’s no information to sway his opinion. But the writer with a solid LinkedIn biography and a professional writer’s website with a portfolio of work is more likely to get the assignment. 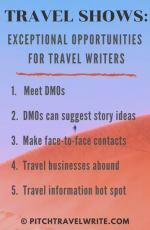 In the above scenario, the writer will score bonus points if the editor googles, “your name + travel writer” and sees a significant number of links to your travel stories. 5. It can benefit the editor and publisher. You’ll gain even more bonus points if your Facebook page provides evidence of your professional writing skills and assignments in print and online. Perhaps even more points if you post on Twitter, Instagram or Pinterest. Why would your presence on social media warm a magazine editor’s heart? The answer is simple: Your social media presence means more potential readers for their magazine. Here’s how it works. Whenever I have an article published in print media or online, I brag about it through my social media. This means some of my followers will buy the issue with my story. Some might subscribe to the magazine. Everyone at least becomes aware of the publication. Writers with a sizeable social media presence bring a portable crowd of potential readers and fans to the table. While this is only one side benefit of having a social media presence, it should be mentioned in your query letter. There are a number of self-promotional techniques you can use to improve your visibility and enhance your credibility as a freelance writer. Here’s what a freelance travel writer’s marketing platform should contain. Although I only mention Facebook and LinkedIn above, you can also consider other social media such as Twitter, Pinterest, Instagram and a well written, professional and focused blog related to your writing genres. If you’re a novice travel writer, the above list will look formidable. But as English playwright John Heywood once said, “Rome wasn’t built in a day”. No one expects you to create your entire marketing platform overnight! Instead, build it brick by brick. Approach it with consistency and you’ll soon have it up and running. And the writing assignments will start coming in faster. Some things on the list are easy to do. Do those things first. Then add to it a little bit at a time. For example, if you don’t have any bylines yet, put some of the other “bricks” in place first. You can set up a Facebook page and a LinkedIn profile. As you get some bylines, add those to your writer’s website. Once you get to know an editor and produce a few well-written articles, ask for a testimonial. Little by little, add to your platform as the opportunity presents itself. Eventually you’ll have a respectable marketing platform. Not every component of your marketing platform will ‘work’ for you automatically. Each piece should be planned, analyzed and then tweaked. You’ll try new marketing techniques over time. Be prepared to abandon (or tweak) things that aren’t effective.